In this week’s newsletter we reveal our Great Omlet Bake Off top 10, with your chance to vote for the winner. With all those tasty looking entries, and our addiction to the Great British Bake Off on tv, we thought it was a jolly good time to offer you a discount on our range of baking goodies. Get 20% off a selection of gorgeous accessories this weekend only! (uk only). You’ve stirred, whipped and beaten your way to some magnificent entries to The Great Omlet Bake Off, and we’ve been drooling over your beautiful bakes, cakes and pastries. Unfortunately we didn’t get to put them to the taste test (if anyone fancies popping one in the post, please feel free), but we deliberated over the photos for some time before choosing our top 10. All of our finalists have created delicious looking dishes and it would be far too hard for us to pick a winner…which is why we’re letting you decide. Please take a few seconds to view our finalists and vote for your favourite three bakes here. Voting closes at midnight on October 13th, and the winners will be announced shortly afterwards. The winner will receive a £100 Omlet voucher, and there is a £50 and a £25 voucher up for grabs too. But, nothing beats the title of Great Omlet Baker 2013! Click here to cast your vote! Worried about your chickens now that the cold, dark nights are drawing in? 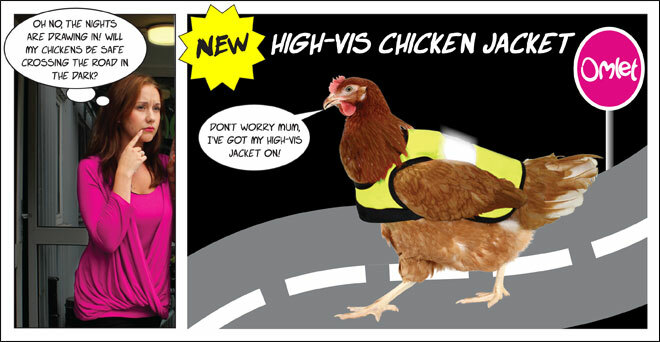 Don’t panic, because the High-Vis Chicken Jacket has arrived. Available in two colours, pink and yellow, or as a twin-pack, this health and safety gilet will make your pets visible on the darkest days, while protecting them from the rain and sleet. The High-Vis Chicken Jacket is easy to use. Just gently put your chicken’s wings through the arm holes and fasten at the front. The velcro fastening is adjustable, allowing for the perfect fit so that your hen is comfy, and the jacket contains an inner bodywarmer, lined with NASA-appproved Flectalon, for insulation. Ok, your chickens may not be planning a space mission anytime soon, but you’ll never need to worry about them crossing the road again! This month, we were thrilled to hear that lover-of-all-things-stylish Jen, at Love Chic Living, gave Qute the thumbs up. Her family had been hoping for some new pets for a while, but she had been disappointed by the look of the cages on offer. When she discovered the new Birch Style Qute though, she was keen to give it a whirl. Jen gave the Qute a sterling review on her award winning design and interiors blog, calling it ‘one of the most stylish animals houses you’ve ever seen’. She opted for the Qute with Storage, which was not only handy for keeping things tidy, but meant that the height of the product made it perfect for a side table. She said ‘several friends have been astonished at Qute’s look’, and she loves the way it has ‘blended beautifully’ into her home. But, what do the gerbils think of it? The Lift ‘n’ Twist tube, removable bedding tray and upper section for eating, drinking and playing make their lives safe, fun and comfortable, and the clear perspex tray allows for easy interaction with their owners. Click here to read Jen’s review. Are there any Geordie Shore fans out there? A little birdy tells us that there are two new additions to the show this season…and they’ve got feathers! Charlotte, one of the reality tv stars, decided that she wanted to start keeping chickens this year, so the cast had a very special delivery of a Yellow Eglu Go and two hens in the first episode. Two weeks in and the chickens have been providing much hentertainment to all the Geordie’s, but there are no eggs yet (despite the boys playing a trick on the girls by placing some in the Eglu). All housemates have bonded with the hens and they love having them as pets, and we’re certainly enjoying watching the relationship blossom! Watch the Geordie chickens in action every Tuesday at 10pm, on MTV. Or click here to catch up on some clips of the show. Fancy keeping a couple of hens in your own garden? Read our chicken keeping guide to get you started! 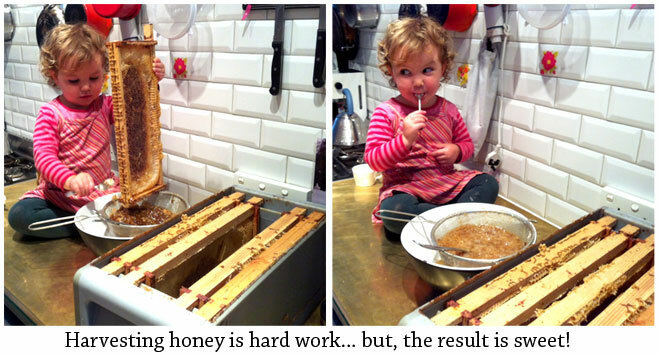 While most toddlers spend their time playing with Duplo or colouring in, this little girl prefers to help with the harvesting of honey from her Beehaus. It’s a hard job for a tiny tot, but the reward is well worth the effort…and who doesn’t like a drizzle of honey on their ready brek!? Next job – collecting the eggs for her omelette. If you like the idea of harvesting your own honey, why not go on a beekeeping course? You can learn all about the Beehaus and get a taster of what bee-ing a beekeeper is all about. Try Stephen’s Beekeeping Taster Course this Sunday, in Somerset or Steve’s Beekeeping Taster Session on Saturday 26th October, in London. The Eglu Cube was on display at the Beleef Landleven show in the Netherlands earlier this month. 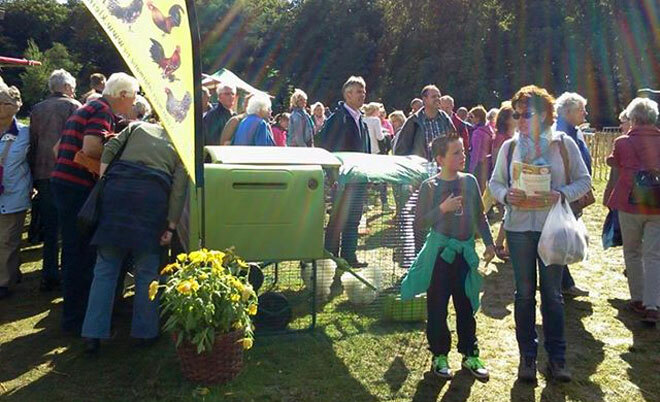 It was a popular event and lots of people flocked in to see our chickens in the Eglu. There was a chicken eggspert on hand to answer questions, and everyone loved having a go at opening the eggport, moving the Cube around and seeing just how easy it is to keep hens. If you live in the Netherlands and you didn’t get to the show, don’t worry – you can read more about keeping chickens, and order your own Eglu on Omlet NL. And if you have any questions, give our friendly dutch representative, Tino, a call on 053-2310184, or send him an email. We’ll keep you updated on future shows! Did you know you can earn money from taking snaps of your Omlet products? Whether it’s an Eglu or an Egg Cup, a Beehaus or a jar of honey, we will give you £1 for every photo we use. But, this time we will be looking for an eggstra special photo too. Upload an image by midnight on Sunday 6th October for your chance to win a £100 bonus. When you’ve got a snap of your chickens enjoying their Walk-In-Run, your daughter playing with her Toy Tea Set, or your morning coffee in your favourite mug, just find your Omlet product on the website and click on ‘upload a photo’. You’ll get an email if we use your photo, and the winner will be notified on 7th October. 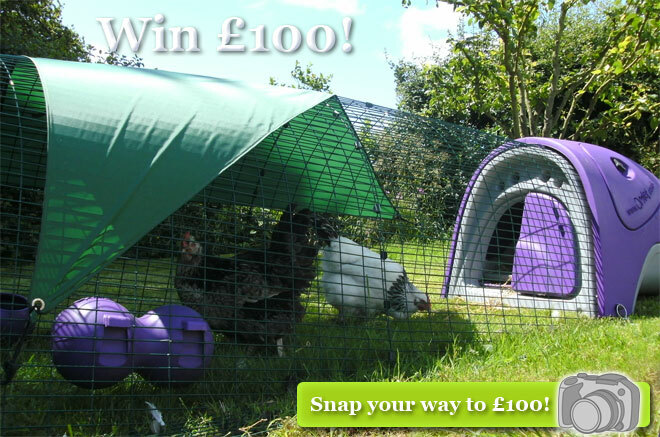 Upload as many images as you like and you could be saving up for a new Eglu in no time. 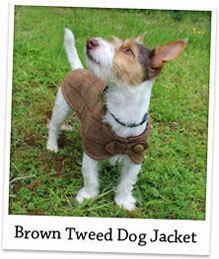 Perdie & Boo Brown Tweed Dog Jacket – With a nip in the air, why not treat your dog to the finest in garments!? Handmade in Scotland, this tweed jacket will keep your pet warm, comfortable and looking dapper! 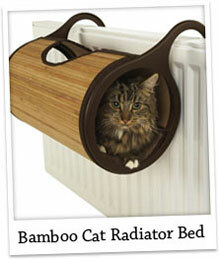 Bamboo Radiator Bed – With winter approaching, your cat will be thrilled to have a snug, cosy bed to curl up in. Hang it on a radiator and your feline will keep wonderfully warm, whatever the weather. 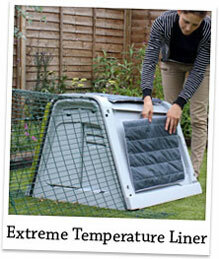 Extreme Temperature Liner for Eglu Go – Made from NASA-developed Flectalon, this Liner will keep your Eglu Go insulated during the coldest nights. Simply slot it under the coloured panels for extra reassurance.